(TibetanReview.net, Jun15, 2016) – In his first public appearance during his current, Jun 12-28, visit to the United States, Tibet’s exiled spiritual leader, the Dalai Lama, led a silent prayer for victims of the Jun 12 morning mass shooting in Orlando as he took part in a workshop that kicked off a worldwide “peacebuilding” campaign in Washington, DC. The Jun 13 event was organized by the United States Institute of Peace (USIP) with the participation of the House Democratic Leader Nancy Pelosi. 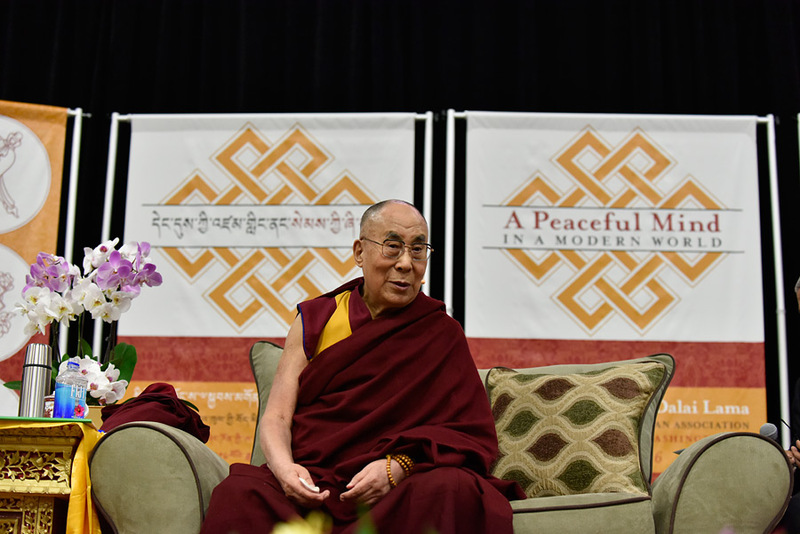 Later in the afternoon the Dalai Lama visited the American University where he was welcomed by Richard Gere, Chairman of the International Campaign for Tibet, as well as Nancy Pelosi. 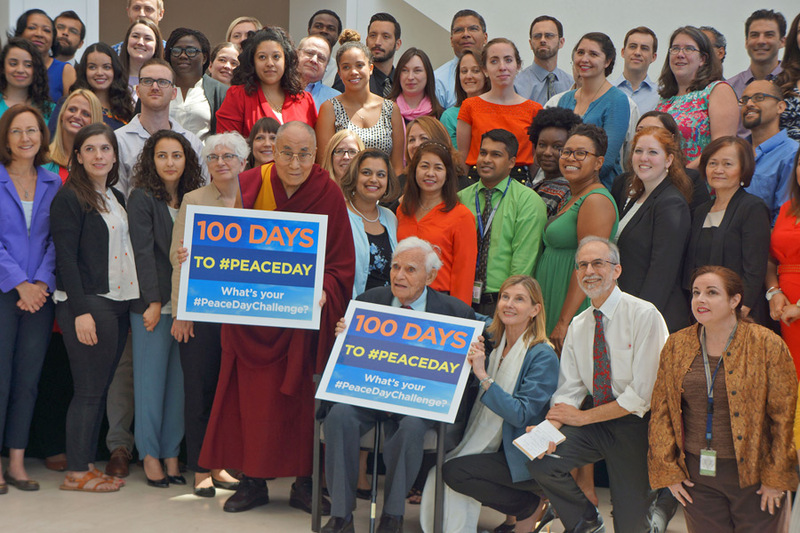 The morning event kicked off 100 days to the International Day of Peace on Sep 21, which is being promoted on social media as #PeaceDay. He was welcomed to the event by USIP’s President Nancy Lindborg who had recently led a visit by a group of 28 youth leaders from countries in conflict to meet the Dalai Lama in Dharamsala. Following a breakfast meeting with Lindborg and Pelosi, the Dalai Lama opened the workshop meeting with an invitation to the gathering to observe a moment of silent prayer for the victims of the mass shooting tragedy in Orlando which had killed 50 people, including the assailant, and injured over 50 others. Others who spoke included Columnist Michael Gerson; Soukaina Hamia, a young leader from the Sidi Moumen Cultural Center, a large slum in Casablanca, Morocco; and Victoria Ibiwoye from Nigeria, who works with a group that helps vulnerable children and youth. Lindborg said it was the first time the Dalai Lama hosted so many young people from so many conflict zones. At the American University event later in the afternoon, Pelosi spoke about her 2015 delegation visit to Tibet and noted that local authorities had boasted of having gilded the roof of the temple as evidence of their respect for religious freedom while having subjected to restrictions what is studied in the monasteries. She said there was no better way to honour His Holiness than to be a friend of the Tibetan people. Richard Gere described the Dalai Lama as the greatest advocate of his people and an exemplary proponent of non-violence. He told the Tibetans in the audience not to think only of their livelihood but to remember they were ambassadors for Tibet.